Can You Match Wits With A Child Mathematical Genius? There's a legend in the mathematics community, about how a gifted youngster figured out a problem so brilliantly that his teacher allowed him to study on his own. We'll tell you about the prodigy, and the story, and see if you can guess his methods. He's still a legend in the mathematics community, and in more ways than one. When Gauss was still in elementary school, his teacher wanted some down time and gave the class a time-filling assignment. He asked the class to give him the sum of all the numbers from one to one hundred. Within two minutes, Gauss raised his hand and announced he was done. 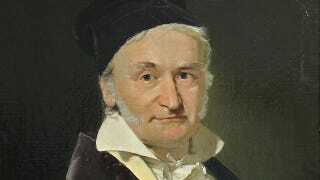 The teacher asked Gauss how he had added a hundred numbers so quickly. Gauss said he hadn't. He'd discovered a way to work the problem so it was simple logic and multiplication. The teacher put Gauss's workbook aside, saying there was nothing more he could teach the kid. Can you figure out how to add up the numbers? Let's take a look. Gauss figured the problem out by resisting the urge to start at one end of the one to one hundred number line and work his way in. He started from both ends, so he added 1 + 100. Then he added 2 + 99. Then he added 3 + 98. Notice something about all those sums? If you start from the ends and add in pairs, every pair adds up to 101, from 1 + 100 to 50 + 51. Since there have to be fifty of these pairs, all you have to do is multiply 101 by 50 to get 5050. Then you get out of math class forever.